Using the logit equation on SRS to estimate game winner probabilities. Bricklayers vs. Gladiators in baseball. Chase ranks teams according to how many teams have had their best game against them. Is Peyton on pace to break the TD record? (O.P.) Is Eli on pace to break the interception record? How big have college players grown? Do teams need a Stat-Whisperer? (gated) Tango's discussion. Which teams have started the most QBs since '99? Repeatability and survivorship bias in the NHL. Applies to all sports. Helmet-knock Tango. Phil gives due credit to Pete Palmer, one of the early legends of football analytics and co-author of Hidden Game of Football, along with Bob Carroll and John Thorn. I frequently cite Hidden Game, but I should probably cite the authors' names rather than the title of the book. By the way,watch this space--We will soon be hearing from Pete Palmer and John Thorn in their own voices in our series of interviews with the pioneers of football analysis. Sadly, Bob Carroll passed away in 2009. Samer uses data from Football Outsiders to show how poorly the Jags have played this season. Jason uses the WP model to analyze Mike Smith's decision to try a FG down 4. My first observation is that coaches underestimate the chance of conversion on very long distances to go. The probability curve flattens out as you get past 11 yards to go. Also, Smith's explanation after the game was insightful. He correctly mentioned that given the time and his 3 timeouts, he would have enough time left over to get another FG for the win. He's assuming he gets a stop on NO's offense and gets the ball back for his plan to have any hope. But if he's assuming the stop, then you definitely want to go for it on 4th down. Instead of needing both FGs to succeed, going for it gives you 2 bites at a single TD apple for the win. Seth gives us a great viz on how officials penalize home and away teams in the 4 major pro leagues. Extra-credit--he also notes the causation isn't clear. If home teams perform better and make fewer mistakes, it's possible to see such splits in penalties/fouls, even without any officiating bias. Bonus: Here's a site that tracks NFL penalty data since 2009. 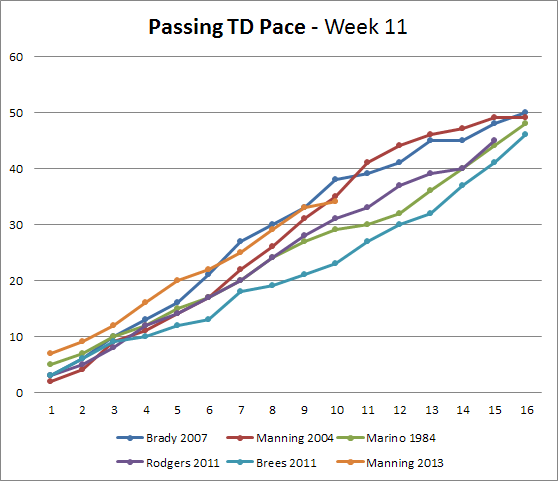 Kirk makes some cool visualizations on the Brady/Manning matchup. My question--Where did he get the pass location data? Looks pretty darn precise. A minute-by-minute look at the week in the life of an NFL coach. Odd, I didn't see any time in there for analytics research. I'm kidding of course, but there is a point. NFL coaches are the hubs of very large, very complex organizations in a high-stakes business. They need to be skilled at so many different things, it's unrealistic to expect them to be operations research analysts on top of everything else they do. If NFL teams were European soccer teams, this is what their logos would look like. Um ... oops, I wasn't thinking of you when I said I thought Pete's book was underappreciated. I'll think about how to update the post. BTW, I assumed that Pete was responsible the sabermetric part of the book, since John's mostly a historian and, as far as I could Google, so was Bob Carroll. If that's not right, I'll correct that too. Interesting reading the Mike Smith 4th down decision. Aside from falling for the field-goal-range fallacy, which is standard among coaches, it seems he also consistently underestimates how easy it is to move the ball. His decision assumed that making a 4th-and-15 was incredibly hard, and that making the Saints go 3-and-out was easy. Looking into his background, it's easy to see why. He played linebacker at college and was in defensive coaching roles all the way through his NFL career until he got the head coach job. A classic case of cognitive bias. He's a defensive guy, he overestimates the effect defense has on an NFL play. I'm guessing Kirk was just using a jitter effect to spread those data points out. In other words, he knows how far down the field the ball goes, and he knows whether it's left, right, middle, so he probably just adds a slight up/down jitter and a large left/right jitter to make the points spread out.